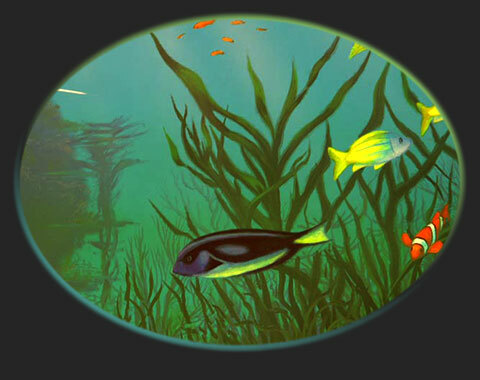 Aquarium Murals - Tropical Fish trompe l'oeil. Another lovely mural from Andy Middleton and myself. This time it's Sealife Murals or Tropical Fish murals, (apologies for keyword writing) This mural was his design, his commission, my help. It's always a pleasure working with Andy, he's a very talented (and very nice) guy! Trompe L'oeil Aquarium window is pretty effective, and creates a relaxing ambience. Pretty Banner or Angel Fish.